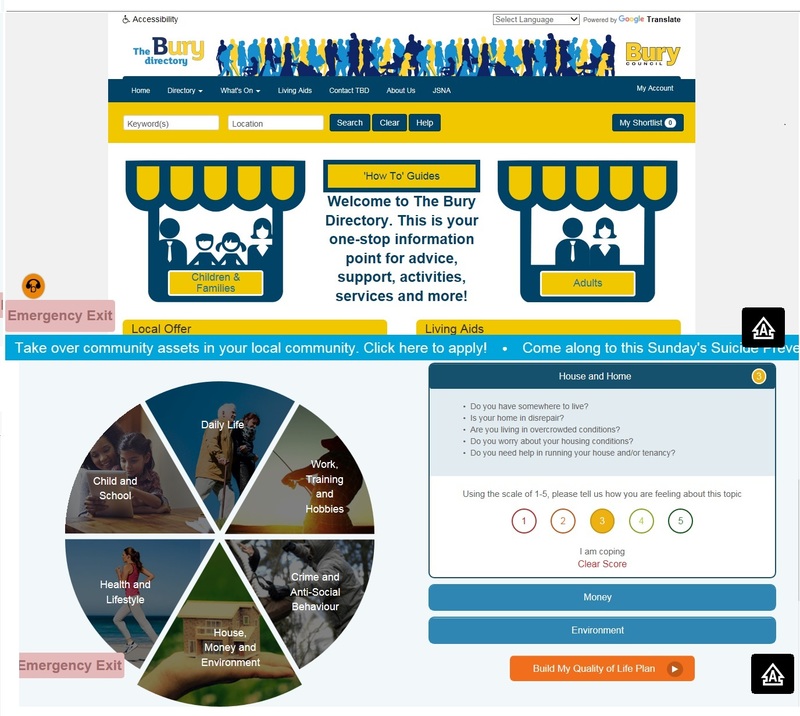 The Bury Directory is our digital platform that enables people to maximise their ability to help themselves and others live a good life, by not just informing them of the assets in their local community but enabling them as active participants, to pro-actively engage with these to improve every aspect of their life. It is a person-centred navigation site for the whole Bury system, covering sections from safeguarding and Bury’s Local SEN Offer, to financial and legal support, leisure and recreation, staying safe, housing and ageing well. The Quality of Life Wheel self-care tool embedded in this enables residents to co-produce a personalised wellbeing plan based on the areas in their life that matter most to them, empowering them them to take control and navigating them to local information (and onto services if required). It is fully integrated with the local Joint Strategic Needs Assessment, mapping the needs of the Borough with the provision in a place, providing crucial intelligence for professionals such as commissioners and our System leaders. Functionality is diverse including community assets and services (including our local VCFS, information on DV and Armed Forces support) and key events, such as the Bury 10k. Scale, functionality and integration are the key features that are innovative. It provides information, advice, support, activities and services for a whole person, family and community, as well as practitioners – one digital system for our whole locality, allowing residents and local agencies to be active participants in improving their wellness, knowing about and empowered to engage in assets in their local community. Continued integration with NHS Choices is seeing a dedicated health channel be developed, forming the basis of a digital social prescribing offer to help people to help themselves live a good life whilst reducing the burden on expensive, over-stretched statutory services across the whole system. This is much more than just a list of local provision to be passively absorbed. People are informed and health literacy increased, enabling an informed choice by active citizens through kitemarks for breastfeeding and autism friendly facilities, Golden Apple and Dementia Action Alliance accreditation, and data harvested from CQC reports. Accessibility includes adjustable text size and high contrast backgrounds, a glossary app to explain acronyms and an emergency exit button to encourage use by vulnerable users. During 16/17 there were 130,060 visits to the Directory, an increase of 76% on 15/16, with a monthly increase in 17/18 of 11%. 1/3 of these were returning visitors. There are over 2,500 entries listed with a 9% increase in mobile usage and social media interactions following a responsive upgrade. The Quality of Life Wheel has been trialled in our trailblazer townships with 100% of users having an improvement in at least one area of their life; with their wellbeing plans providing innovative means of navigating a complex maze of public, private and voluntary institutions that people face in their life, whilst empowering people to engage in local, community based assets in line with NESTA’s People Powered Health approach. Training has been widespread including to the public through community events, 140 police officers, over a hundred Council staff and at the Children’s Trust (including voluntary sector), equipping front line staff to engage and support residents whilst increasing their own personal resilience. The Directory is home to an ‘Independent Living Aids ‘showroom’, open 24/7 from any location, supporting people to stay at home as long as if safely possible, thus reducing the demand on some statutory services.